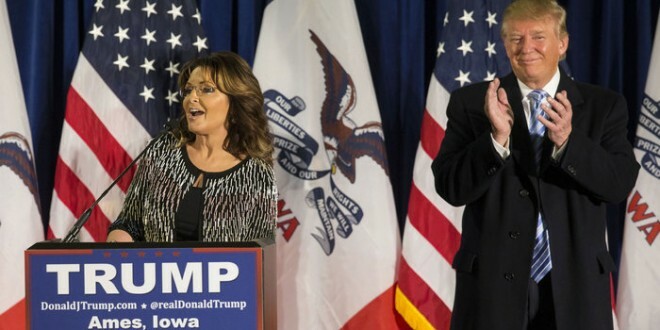 Sarah Palin endorsed Donald Trump for president while in Iowa on Tuesday. After a day of mounting speculation, the Republicans’ 2008 vice presidential candidate, made her appearance in person at an evening campaign event and confirmed she was was backing the tycoon and frontrunner. “I’m in it to win it,” Sarah Palin said, standing next to Mr Trump, who stood and grinned. “He is going rogue left and right,” she said, harkening back to a description she tried to own when running for Vice President in 2008. “Palin’s brand among evangelicals is as gold as the faucets in Trump tower,” said Ralph Reed, the chairman of the Faith & Freedom Coalition. Galloping on, she went on: “He is beholden to no one but we the people, how refreshing he is. No more pussyfooting around, our troops deserve the better. Mr Trump concluded the event by saying, that he knew if he was going to become president, he had to have the support of “Sarah”. Speculation has been growing about the identity of the special guest since Mr Trump told New Hampshire voters on Monday that he would be getting a “big endorsement” on Tuesday. Sarah Palin, the Republicans’ 2008 vice presidential candidate, had backed Ted Cruz’s campaign for the senate. Yet she has repeatedly praised Mr Trump during his White House run, especially over his recent proposal to suspend the admission of Muslim refugees to the US. Though Sarah Palin was a deeply controversial choice to be Senator John McCain’s running mate in 2008, she remains hugely popular among some groups of American conservatives. She is a favourite of the pro-small government Tea Party community within the party, the same constituency Mr Cruz has been seeking to appeal to. Indeed, speculation that the former Alaska governor was going to endorse Mr Trump intensified when a senior aide to Mr Cruz said he would be “deeply disappointed” if she did so. Mr Cruz communications director, Rick Tyler, was asked on CNN whether such an endorsement would be a blow to the senator’s campaign. “She supported the TARP bailout – it goes on and on and on,” said Mr Tyler. Earlier on Tuesday, Mr Trump stopped off at the John Wayne Birthplace Museum, where he received another endorsement, that one from the film actor’s daughter. The backing of Aissa Wayne was announced in front of a life-size, gun-toting model of the actor in full cowboy gear. Ms Wayne says the country needs a strong and courageous leader like her father and that her father would back Mr Trump if he were still alive. Mr Trump said the actor represented strength and power, things that the American people are looking for.